Did James Pluckrose Murder his Wife? This is a sad tale. I will present you with the evidence and you can make up your own mind. James John Pluckrose was born in Brighton on 11th March 1852, the third son of Thomas Jesse Pluckrose and Mary Ann Peart (see tree 1006). At the age of 34, on 14th November 1886, he married Charlotte Walker, the 21 year old daughter of Benjamin William Walker and Mary Hobbs, at the parish church of St Mary in Lambeth. St Mary, no longer a parish church, lies immediately outside Lambeth Palace, the residence of the Archbishop of Canterbury. A daughter, Charlotte Ellen, was born in 1890, followed by Benjamin Thomas in 1891, Thomas in 1893, Edward in 1895, Maria in 1897, Susan in 1900 and Jane in 1904. All were born on the south side of the Thames in the Southwark, Deptford and Greenwich area. However, by 1911 the family had moved to the Isle of Dogs which is on the northern side of the Thames. The Greenwich Foot Tunnel, which was built in 1902, connects Greenwich to the Isle of Dogs. It replaced the Greenwich ferry and effectively brought the two banks of the Thames closer together. The family lived in Stebondale Street. I have no idea what it was like in 1911, but when Charles Booth carried out his survey of the area some 10 to 15 years earlier Stebondale Street was described as "the worst street on the Isle of Dogs" (this does not tie in with his coloured map of the area, however). At the time of her death Charlotte was 46 years old. She appears to have given her husband a hard time, judging from the evidence give at the Police Court after her death. She habitually drank too much and was grossly overweight. The physician who carried out her post mortem examination reported . . . "She was a tremendously fat woman, weighing about 22 stone, 5½ feet high, and her liver twice the normal weight, showing signs of fatty degeneration, as did both kidneys which were rather enlarged.The lungs were congested at the bases and contained fluid. The heart was almost entirely covered with fat: the muscular wall of the right ventricle was only a line or two in thickness, its place being taken by fat. The valves were normal. These unhealthy conditions indicated overeating and alcoholism." It was a hot Saturday in August when the shooting took place. They had been quarrelling for several days before the accident - the quarrels were usually started by Charlotte. They were heard to quarrel at 5.45 a.m. before James went off to work. He came back at 12.30 p.m. to dinner, but ate little, and went out again in 20 minutes. As was their habit, they both (separately) went over to Greenwich in the afternoon. 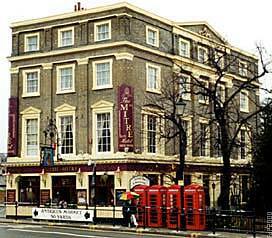 Charlotte was drinking at the Mitre according to a witness. By 9.30 p.m. she was back home and sitting on the top area step again. Shortly after this she was shot by her husband. Read the evidence . . .